Phnom Penh (Agenzia Fides) - "Family is the cell of society and in the family God invites us to become a small holy community, so that the light illuminates the darkness of the human heart and a source of inexhaustible grace quenches our society interested in having and in personal success": this is what Bishop Olivier Schmitthaeusler, Apostolic Vicar of Phnom Penh says in a message sent to Agenzia Fides, recalling that from 2017 to 2019 the community of the baptized in the Vicariate of Phnom Penh lives a time of study, prayer and catechesis on the theme of the family. 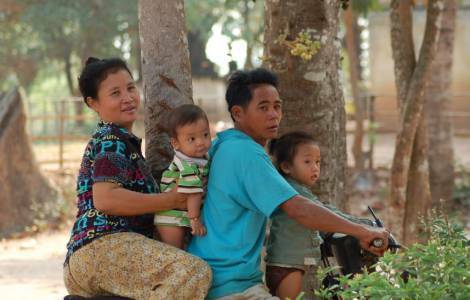 The Apostolic Vicariate of Phnom Penh has in fact proclaimed a three-year period dedicated to the family, following the pastoral outline of Amoris laetitia, which has been translated into Khmer language. 2017 was dedicated to young people and adolescents who face emotional life; in the second year, 2018, the pastoral focus is on engaged couples who are preparing for marriage; the third year will be dedicated to the Christian family as a way of holiness, with special attention to mixed marriages, where one spouse is Christian and the other is Buddhist.